Designer Jen St. Clair from Little Sprout Creations is here with a fantastic HANDMADE GIFT TUTORIAL today! 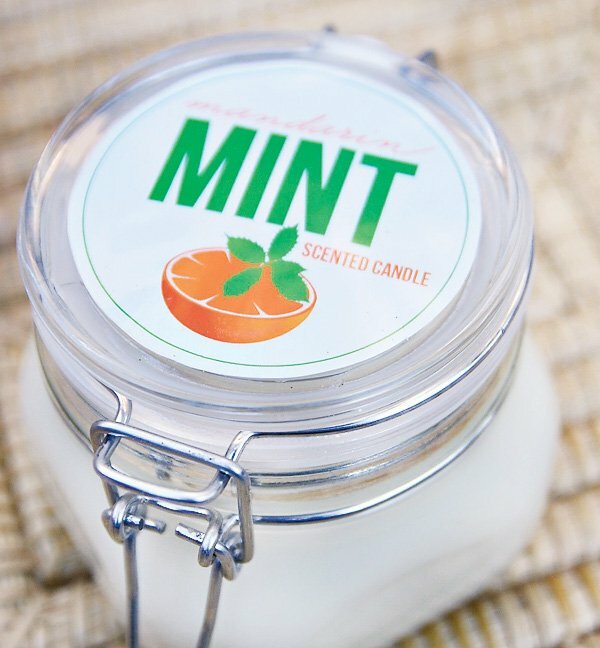 These All Natural Mandarin Mint Candles and Cleaning Sprays are wonderfully creative ideas for homemade hostess gifts, housewarming presents, and more. After reading about the all-natural cleaning sprays below (and seeing how easy they are to mix up), I’m actually excited just to try this “recipe” out in our own house too! “Finding that perfect, original gift is tough. 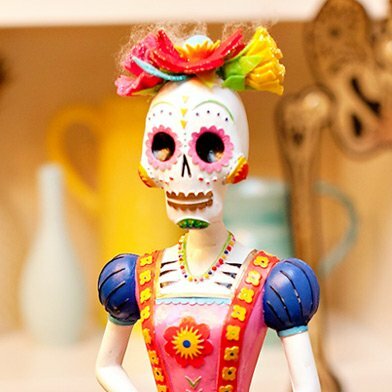 Finding that perfect, original gift while trying to keep within your holiday budget? Even tougher. Homemade gifts are a great way to give unique gifts and save money, and today we’ll show you how to make a great gift AND help you make it into a picture perfect presentation with free printable labels! 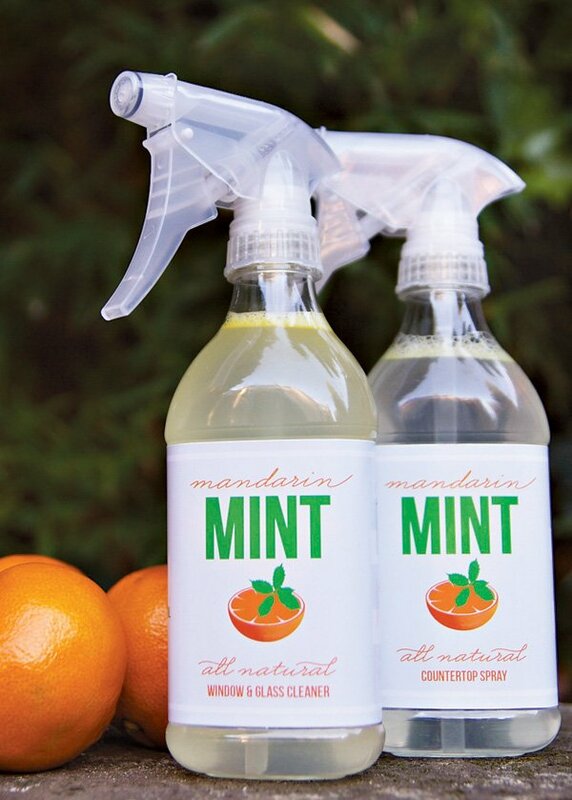 This all-natural, mandarin-mint scented cleaning set is a perfect choice for your holiday hostess, that friend who just moved into her dream house, your daughter’s violin teacher. 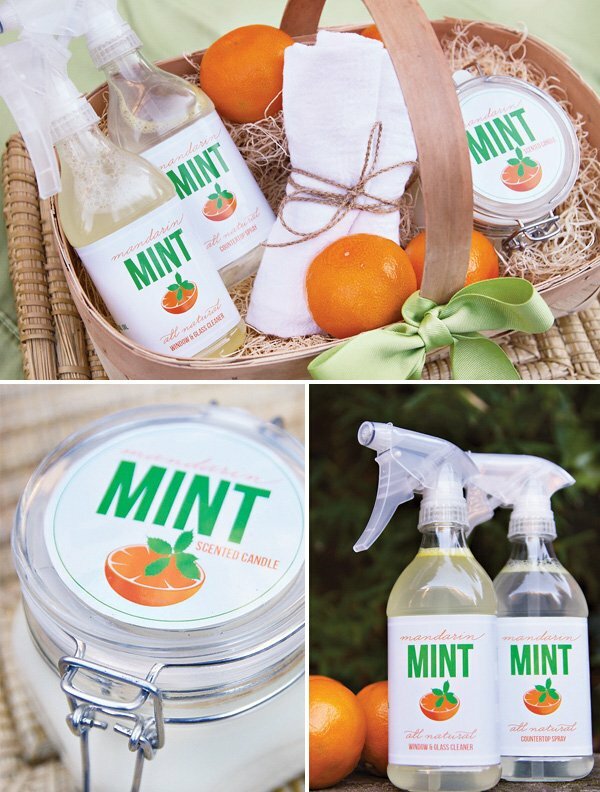 The set includes an all-natural window and mirror cleaner, an all-natural countertop spray, a soy wax candle, organic cotton towels and sweet mandarin oranges, all tucked into a cozy basket. Mix well before each use to avoid streaks. Add more or less (or different type of) essential oil depending on your scent preferences. Use newspaper instead of paper towels for an incredible, streak-less clean. It’s true! Get a large pot of water boiling on your stove. Fill your melting pot with wax chips. Hold melting pot in boiling water, as if you’re melting chocolate. Stir wax occasionally. As it starts to melt, you can add more wax chips in (depending on how many candles you’re making.) For stirring, I use the non-business end of a wooden spoon. Within about 5 minutes, your wax should be nearly melted. The wax will go from solid chips, to a cloudy-chunky mixture, to a completely clear, yellow-tinted liquid. Add your oils – keep smelling until it’s the concentration that you’d like. Grab your wicks, place them into your jars, and pour in the wax. To hold the wicks in place, I typically wrap the “lighting” end of the wick around a skewer and lay the skewer across the lip of the jar. Allow your candles to set. This usually takes about 30 minutes to an hour, depending on the size of your jar. Trim your wicks – i usually trim mine to about 3/4”-1”. Place near your nose, smell, and enjoy your hard work. 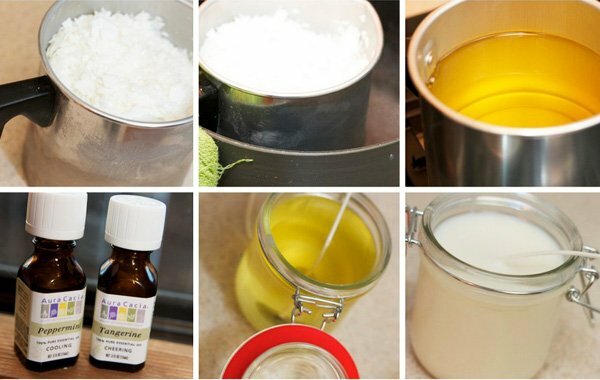 Once you’ve made your all-natural cleaners and candle, it’s time to get them prettied up for giving. 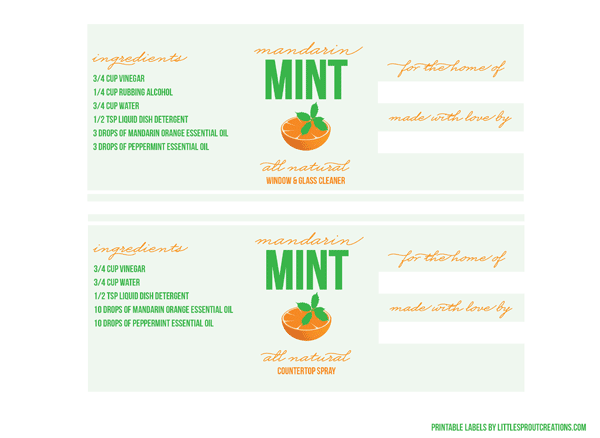 Print our free printable labels (with list of ingredients and ‘to & from’ text areas!) onto full sheet labels or cardstock. (Find links to download below.) Glossy or waterproof labels will help ensure that cleaner droplets won’t make your ink run during use. I’m a huge fan of Labels by the Sheet. 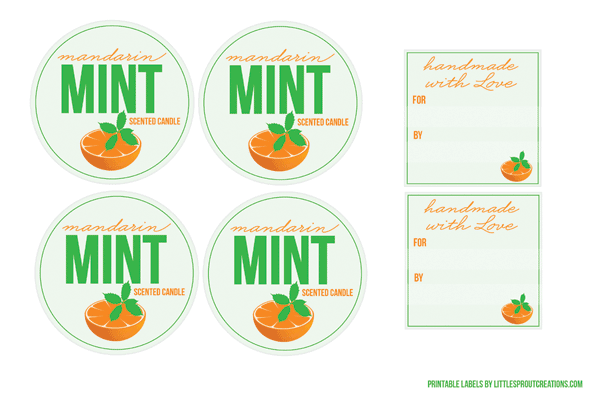 CANDLE LABELS: Click to download in PDF or JPEG. CLEANER LABLES: Click to download in PDF or JPEG format. For the perfect presentation, fill a small basket with excelsior (container store has both), and tuck the cleaners and candle inside, padded with either an organic cotton towel, or a few natural, biodegradable sponges. For the sponges, twist brand is great & available at Whole Foods. 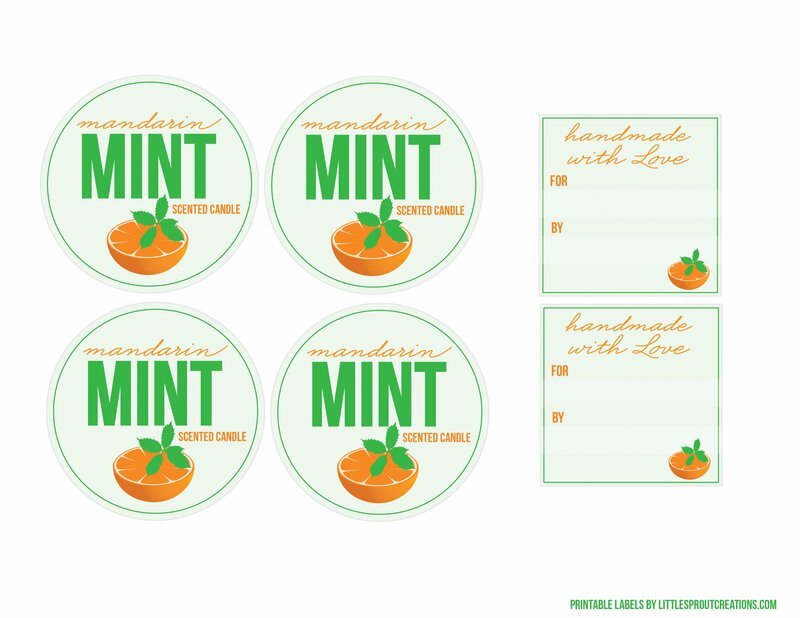 Tuck in a few mandarin oranges to complete the set, and attach our included ‘Handmade with love’ gift tag (included on the candle label printable). P.S. Have other homemade gifts you’d like custom labels for? 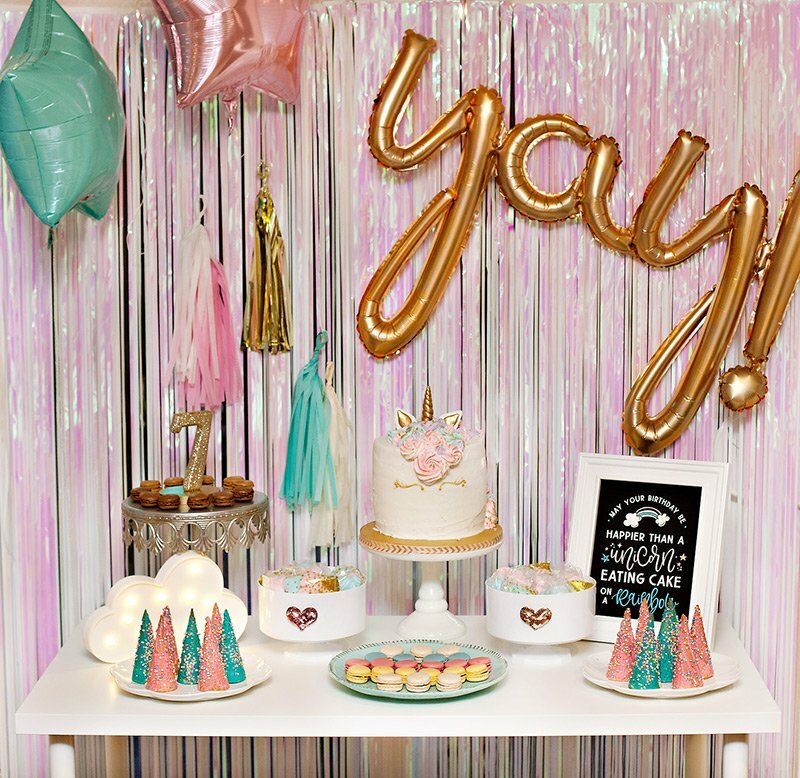 At Little Sprout Creations, we use our passion for graphic design & handcrafted paper goods to turn your idea seedlings into blossoming celebrations, complete with invitations, decorations, favors, and more. Contact us for information. I ran out of counter spray tonight and didn’t feel like going to the store so I tried your recipe for the counter spray. WOW! Works better than store bought. I love it. I will never ” buy ” it again. The scent I used was clean linen. Thank you!!! Such a fan of these recipes that don’t include weird stuff I wouldn’t have at home already. 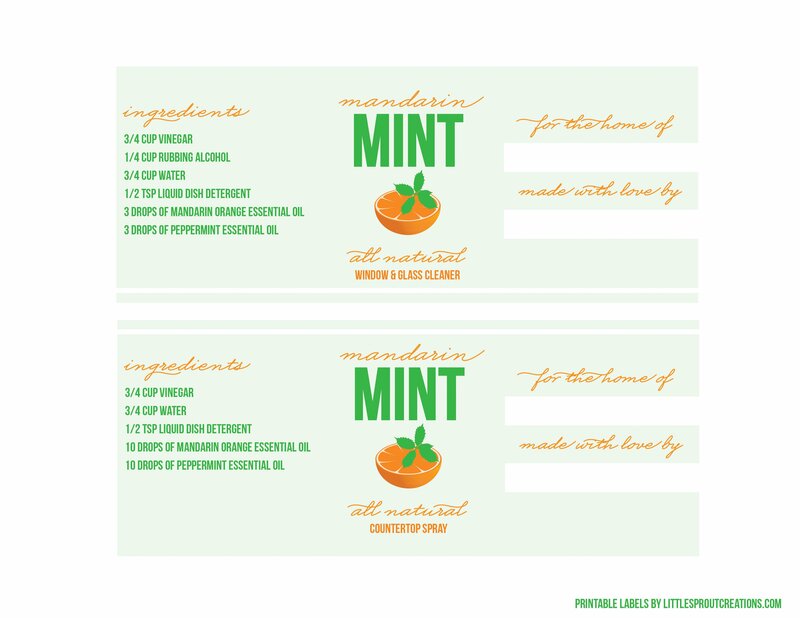 I’m also a citrus mint gal all the way. Thanks for posting this! I’m totally making a home stash (especially the candles) when I can gather some time after the holidays. I am having trouble with the .jpg for the cleaner – it keeps bringing up the .jpg for the candle. 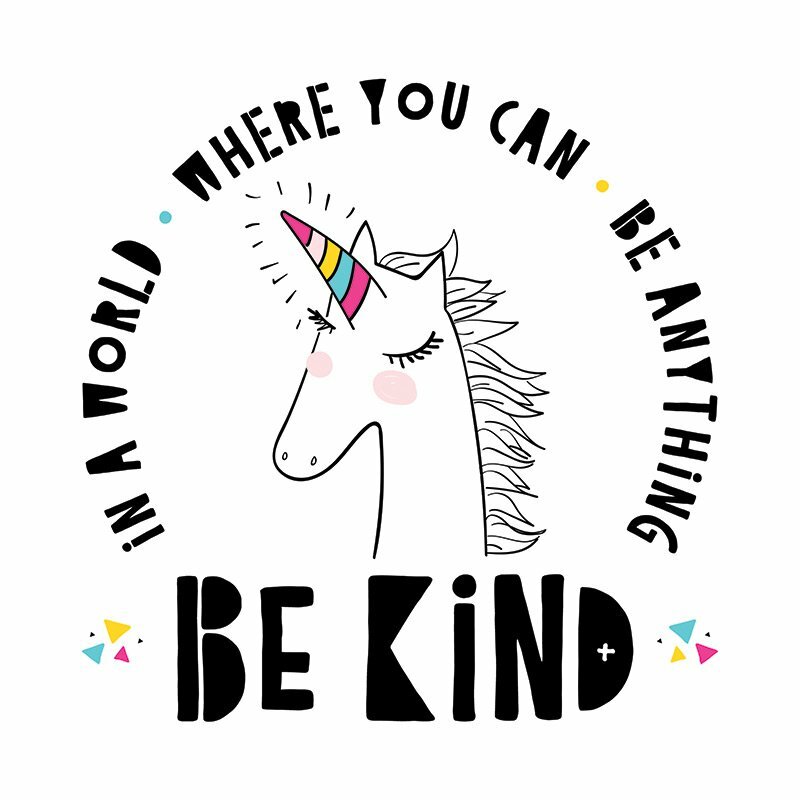 Love this!! 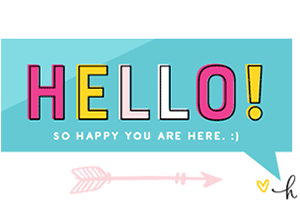 I accidently made the one for the windows…can I still use on the countertops?? 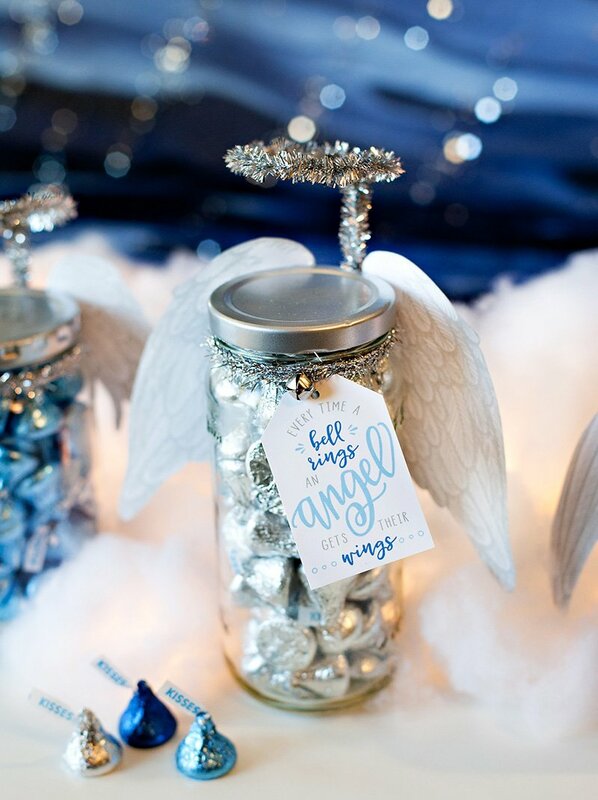 I love this gift idea! Would you mind sharing what size jars you used? And, do you know how much wax it takes to fill one jar? I’m going to order the supplies and I need a rough estimate so I do under/over buy. Thanks! curious….maybe i missed this before, but why are the oils now crossed out in the directions? help? 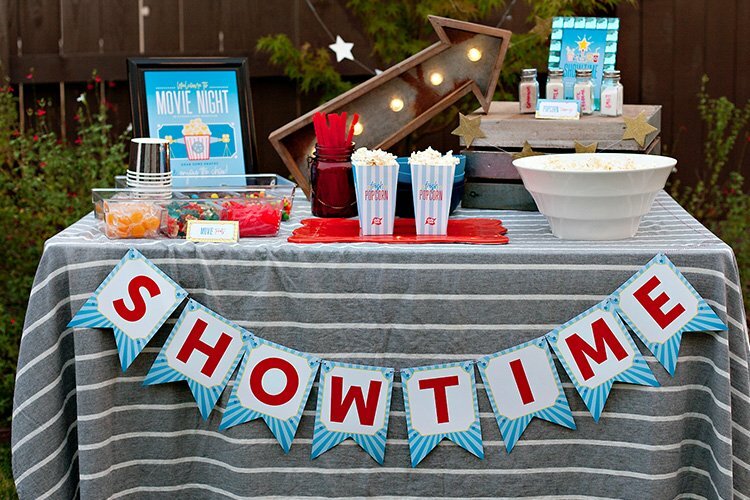 Love these, and they seem really simple to make! Hi quick question while looking through the instructions regarding the oils. Are you using 3 different essential oils? And if so 3 drops of each? I hope you can clarify for me. Love the recipes and labels, I just would love to know where you bought the spray bottles???? Could you use castile soap instead of dish detergent in the countertop spray? Is it 3 drops of each oil or do you use just one oil. You have amazing ideas! Have you ever learn chemistry or something like this because you know a lot about all of the ingredients int he cleaners. Thanks a lot for sharing with us! lavender and tea tree oil are the most potent as far as antibacterial properties go. That’s why I use them in particular so much. However, many of the essential oils are antibacterial, as that’s how they work in nature to protect plants from disease. Other good ones are eucalyptus, lemon, and orange. But tea tree oil really packs the most! Best regards! Sands End Carpet Cleaners Ltd. I love reading DIY articles and this one is really useful! I can make my own cleaner and candle which I could give as a present. Thanks for sharing!Becontree Heath Carpet Cleaners Ltd.
seem really simple i will be make!! http://www.candlewic.com/candle-making/candle-making/page.aspx?id=1381 – has great scents and waxes too!